Download this white paper to discover the business benefits this platform has on the LOB community, and their clients. An outstanding customer experience requires more than just simplifying the order process. 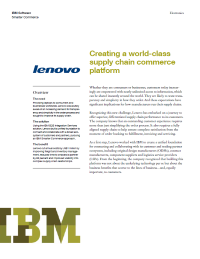 Lenovo is looking to automate the freight payment transaction process to improve visibility and predictability of costs through a customer-centric approach.